My Absolute favorite soup! 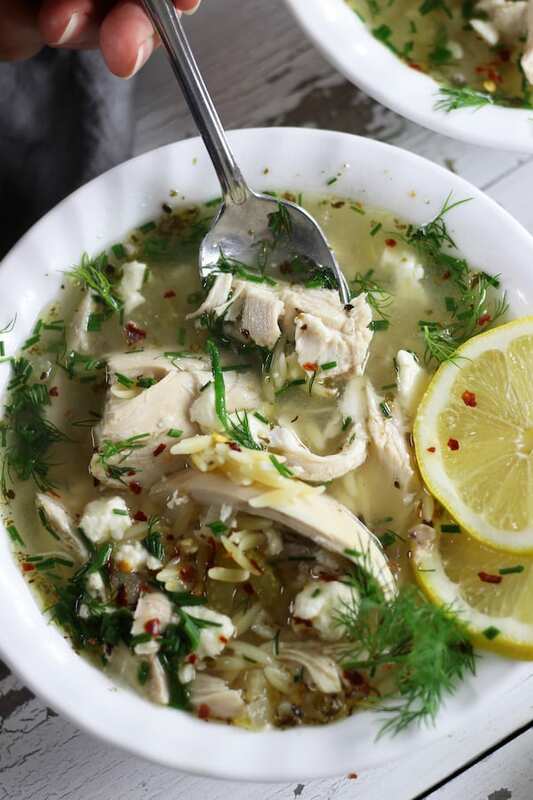 Lemon Chicken Soup is a savory and comforting family friendly meal that even picky kiddos love. With orzo and the flavors of Greece, this easy meal will brighten a chilly day. What happens when two of your favorite things come together in one meal? You act like a kid eating their first ice cream cone!!! 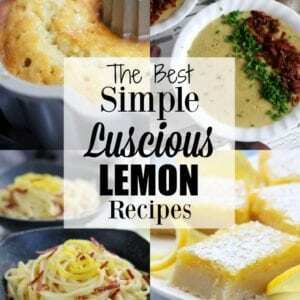 That is exactly what happens with this Lemon Chicken Soup. I am complete heaven!!! I have always been very partial to chicken soups like my Mom’s Chicken Gumbo Soup and Homemade Chicken Noodle because they are so comforting in chilly weather and even better when the colds and sniffles happen. 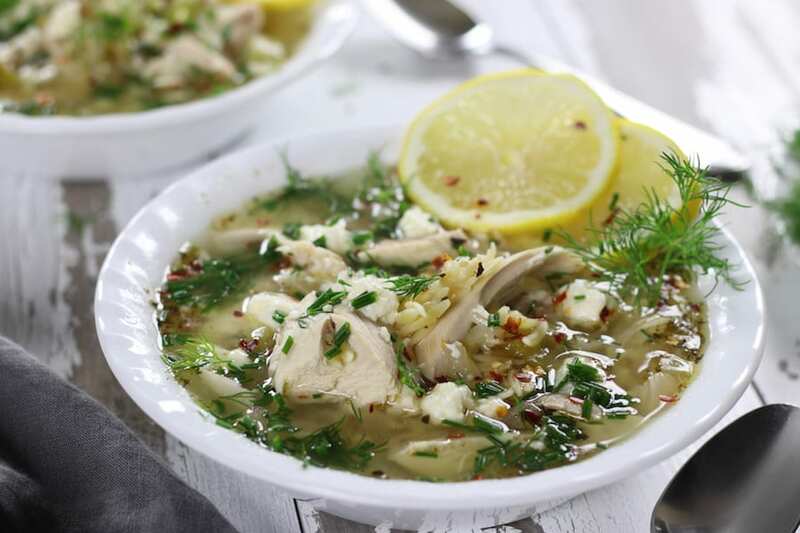 But there is something about this Greek Style Lemon Chicken Soup that takes it to the next level. It has a rich a savory broth, the perfect amount of lemon zing and biting into the strips of lemon zest is beyond amazing. Finish off the soup with feta, chives and fresh dill and this soup becomes not only a classic but literally my FAVORITE soup! There really is nothing quite like a soup made from a whole chicken. 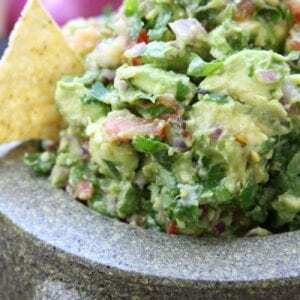 It creates such amazing flavor and richness. My parents were making whole chicken soup since before I was born so it has been a completely natural way for me to make soup. I do realize that it can feel very odd to simmer a whole chicken so here are a few detailed tips to keep in mind. But please do not worry, it really is extremely easy once you are comfortable with the process. Open your whole chicken package in the kitchen sink with a large stockpot right next to you. This will help keep the chicken juices confined to the sink, which will help make sanitizing easier. Don’t worry about rinsing your chicken but DO REMOVE the inners of the chicken. Depending who you buy your chicken from, some chickens will have the neck, gizzard, heart, kidneys and liver inside the cavity of the bird. This little bundle of joy is also called the giblets. I often discard mine when making chicken soup, however they can be simmered in a separate small pan and then the broth added to the base of the soup. Pro Tip: If using the giblets to make a stock do not use the liver as it will add a bitter flavor and make sure to strain the broth created from the giblets. Transfer your whole chicken to your stockpot and add in the celery, onion, garlic. oregano, lemon zest, lemon juice and broth. Bring to a boil over high heat or medium/high heat. It will take about 15- 20 minuets to bring the pot to a boil. Once boiling lower the heat down to med/low and cover with a lid. At this point you want a simmer, where the broth still has a low boil but it is definitely not rapidly boiling. If still rapidly boiling lower the heat to low. Now walk away and go do something else. Only check on your chicken a few times to make sure it is not rapidly boiling. 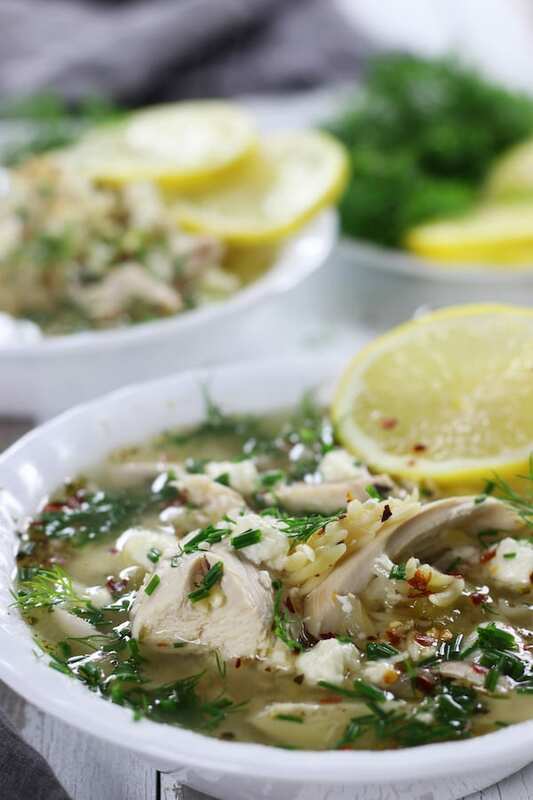 For smaller birds, like what is called for in this Lemon Chicken Soup, it will take about 45 minutes for the chicken to cook all the way through. For larger birds, cooking times will go put to 60-70 minutes. You will know your chicken is done because it will literally start to fall off the bone as you lift the whole chicken out of the pot. Transfer your cooked chicken to a platter carefully. The chicken is usually so tender that the legs and wings will usually fall off, splashing in the hot liquid and possible onto you. This item and this one should help with the removal. Spread the chicken pieces out on the platter to help cool faster. You will want the chicken cool enough that it doesn’t burn your fingers as you debone. This will usually take about 15-20 minutes. Pro Tip: Placing the platter of chicken in the refrigerator for the 10- 15 minutes will help to cool faster. With clean hands remove the chicken meat from the bones into large to medium size chunks. As longs as the chicken is cool enough that it doesn’t burn you, this step is extremely easy. It helps to have a clean plate to place the chicken chunks onto. Once the meat is off the bone, add back into the soup. 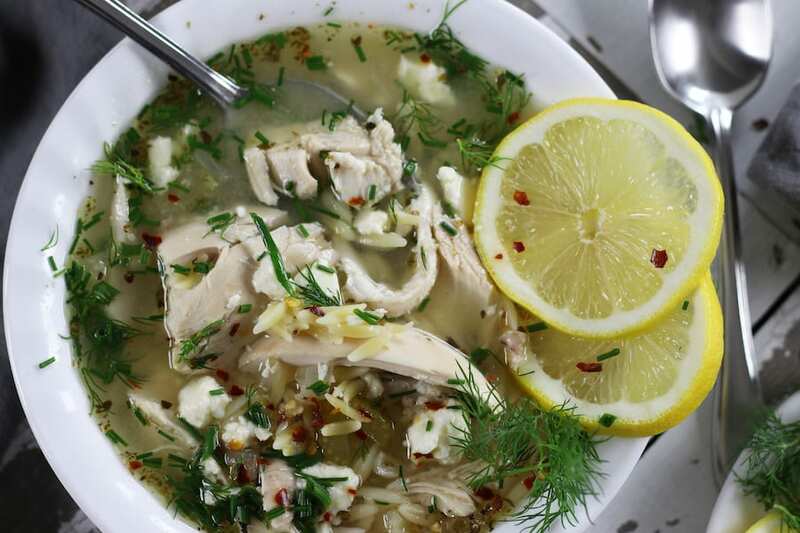 To make a truly fantastic Lemon Chicken Soup there are a few tricks of the trade. Start with a whole chicken and simmer in chicken stock or broth. 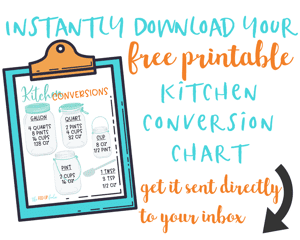 See tips above. 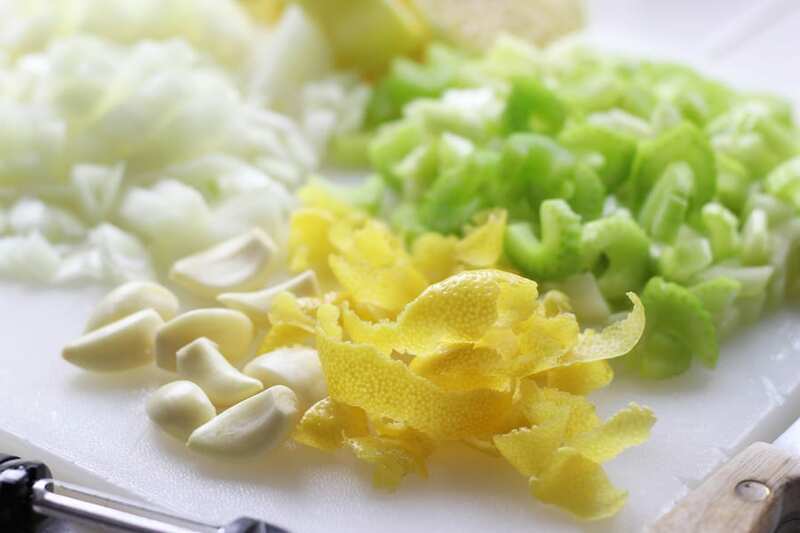 Create strips of lemon zest using a vegetable peeler, making sure to only remove the zest and leaving behind the white pith. Simmering the chicken with aromatics of plenty of garlic, onion, celery and oregano will help to create a rich and flavorful broth. Once the chicken is fully cooked and removed from the pot, do not discard the lemon zest strips. Leaving these in the soup add an amazing twist. To me biting into the lemon zest was like eating candy. Not literally, but it was such a pleasant surprise. Garnish with fresh cut dill, chives, crumbled feta and red chili pepper flakes for even more amazing flavor. The beauty of this soup is that it is fresh, savory and delicious as is If you desire to add more veggies here are a few options that would be very tasty. Yellow Squash (aka Summer Squash)- Added and cooked at same time as orzo. Zucchini – Added and cooked at same time as orzo. Carrots- Best added at the time of cooking the chicken. 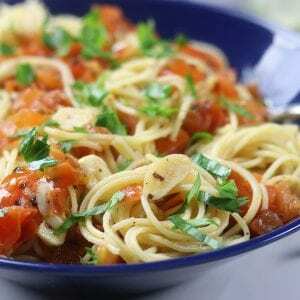 Mushrooms – Added and cooked for about 7-10 minuets before orzo. Green Beans- Added and cooked for about 7-10 minutes before orzo. The act of making lemon zest is done by scraping the outer yellow fragrant skin of the lemon off of the fruit, leaving behind the white pith. This is my favorite tool to zest lemons but for this soup recipe a simple vegetable peeler works best. Can You buy lemon zest? Yes, lemon zest can be purchased in dehydrated form. 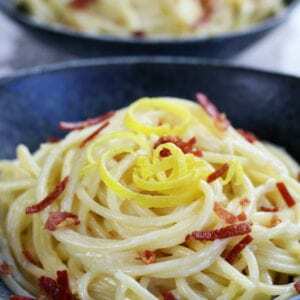 One word of caution though, lemon zest tends to loose the appealing citrus taste and scent when dehydrated. True lemon lovers may be disappointed by its use. Can you use rice instead of orzo? Absolutely! Simply replace the orzo with 3/4 cup of rice of your choosing. I would personally suggest using brown rice as it tends to be nuttier tasting and will hold up better in this Chicken Soup than plain white rice. Pro Tip: If using short grain brown rice, precook to as to save time. This type of rice can take up to 45-60 minutes to cook. Can you freeze Lemon Chicken Soup? Absolutely! If you only have a few people eating it is best to place the pot in the refrigerator overnight to chill completely and then to divide into freezer containers. Just know though that if you have complete lemon lovers eating this, you probably won’t need to freeze any. I can eat this soup for breakfast, lunch and dinner and then want more the next day.